Minecraft UUID Mod help you to enter your Minecraft username, which will fetch your UUID from the Mojang server. 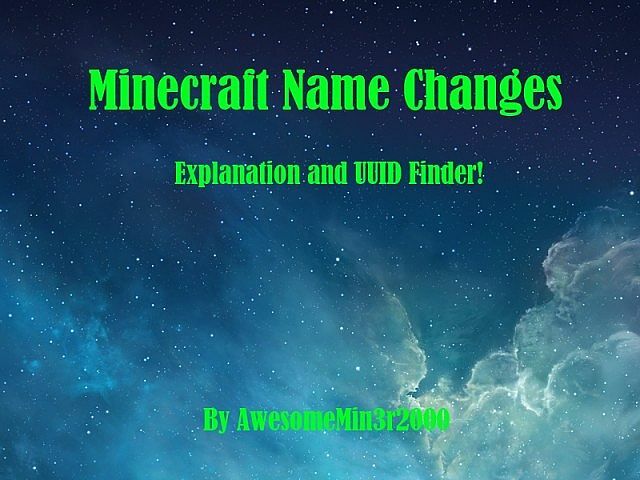 This mod can somehow solve the problem that Minecraft name changes will screw up server band and help a few people who do not understand the concept of a unique user ID. It is not completely useful in all cases, however, AwesomeMin3r2000 just wanted to prove to those people who do not believe in UUIDs, that they do exist. This application runs in a DOS shell on a windows computer, and a terminal window on a mac. AwesomeMin3r2000 have not used this on Linux, so it might not work. This is developed in Java, and AwesomeMin3r2000 am using GSON to convert the profile criteria to JSON. Download the JAR file. Open a DOS window (PC), or a terminal window (MAC), and navigate to the location of the downloaded JAR. And well, just enter you MC username, and press enter. The application will probably pause for a second, because after all, it is fetching your profile criteria from the Mojang servers, and converting it to JSON. Remember: When entering you MC username, it is case sensitive. Your Minecraft UUID is: Could not get UUID. If you want, you can even enter your friends MC username, or your siblings, or some famous YouTuber’s username. However, if you attempt to do something harmful with the UUID, you will fail, because, well, the UUID is originally made public by Mojang via their API. Meaning, nothing (harmful) can be done with this ID. How will name changes work? Ok, so now, to (re)explain how this will work. If you look at the second picture (a smexy diagram with so many colors), you can see the overall structure. I may have the diagram drawn backwards (programmatically speaking), however, it shows the overall gist of it. You have your overall MC account. This is in the top of the heiarchy list. Under that, you have your IGN, so, what you appear as in game. However, this will be able to be changed in the future. Below all of that, you have your UUID. This will never ever change. Your account get assigned one the day you purchase MC, and never changes. So basically, when names changes come out, you will be banned based upon your UUID and your IP. Not your username. Sure, your username will be what is used for the command, instead of a 16 character ID. You guys understand it now? If not, leave a comment, and AwesomeMin3r2000 can explain it to you more.